Theodore Metochites (1270-–1332) was a Byzantine statesman, author, gentleman philosopher, and patron of the arts. From c. 1305 to 1328 he held the position as personal adviser (mesazon) to emperor Andronicus II Palaeologus. Metochites was born in Constantinople as the son of the archdeacon George Metochites, a fervent supporter of the union of the Orthodox and Catholic Churches. After the Second Council of Blachernai, his father was condemned and exiled, and Metochites seems to have spent his adolescence in the monastic milieux of Bithynia in Asia Minor. He devoted himself to studies of both secular and religious authors. When Andronicus II visited Nicaea in 1290/1291, Metochites made such an impression on him that he was immediately called to the court and made Logothete of the Herds. Little more than a year later, he was appointed a Senator. Besides carrying out his political duties (embassies to Cilicia in 1295 and to Serbia in 1299), Metochites continued to study and to write. In 1312/1313, he started learning astronomy from Manuel Bryennios; later he himself became the teacher of Nicephorus Gregoras. He was married with five sons and one daughter, Irene (spouse of John Palaeologus). Metochites’ political career culminated in 1321, when he was invested as Grand Logothete. He was then at the summit of his power, and also one of the richest men of his age. 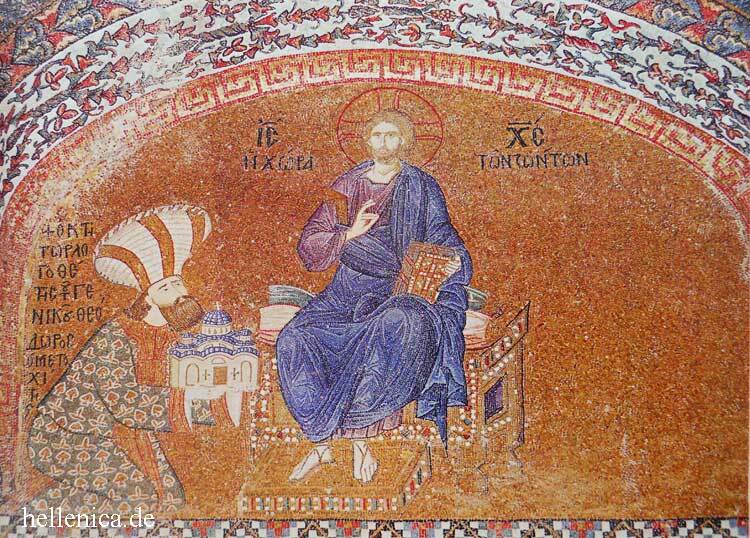 Some of the money was spent on restoring and decorating the church of the Chora monastery in the northwest of Constantinople, where Metochites’ donor portrait can still be seen in a famous mosaic in the narthex, above the entrance to the nave. Metochites’ fortunes were, however, linked with his emperor’s. After a few years of intermittent civil war, Andronicus II was overthrown in 1328 by his own grandson, Andronicus III. Metochites went down with him. He was deprived of his possessions and forced into exile in Didymoteichon. In 1330, he was allowed to return to Constantinople. He then withdrew to Chora, where he died on 13 March 1332, having adopted the monastic name Theoleptos. Metochites’ extant œuvre comprises 20 Poems in dactylic hexameter, 18 orations (Logoi), Commentaries on Aristotle’s writings on natural philosophy, an introduction to the study of Ptolemaic astronomy (Stoicheiosis astronomike), and 120 essays on various subjects, the Semeioseis gnomikai. Many of these works are still unedited. Beck, H.-G. 1952. Theodoros Metochites: Die Krise des byzantinischen Weltbildes im 14. Jahrhundert. Munich. Ševčenko, I. 1962. La vie intellectuelle et politique à Byzance sous les premiers Paléologues: Études sur la polémique entre Théodore Métochite et Nicéphore Choumnos. Corpus Bruxellense Historiae Byzantinae. Subsidia 3. Brussels. Ševčenko, I. 1975. Theodore Metochites, the Chora, and the Intellectual Trends of His Time. In Underwood, P. A., ed., The Kariye Djami, vol. 4, Studies in the Art of the Kariye Djami and Its Intellectual Background, London (ISBN 0-691-99778-x), 17–91.